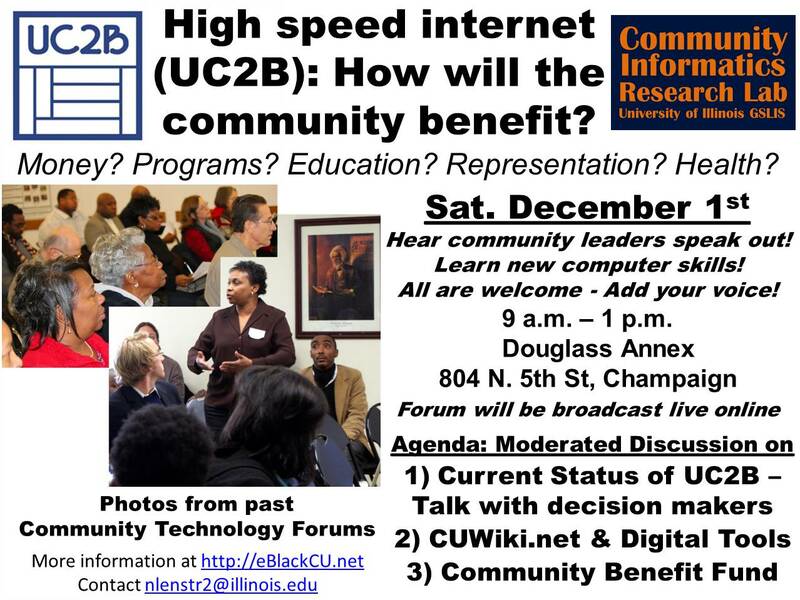 Approximately 65 people attended a public forum on UC2B & The Future of Champaign-Urbana on Saturday, December 1, 2012, at the Douglass Annex, 804 N. 5th Street, in Champaign, 9 a.m. to 1 p.m. The video of the event will be available shortly. Download the flyer for more information. Over 600 people have attended Public Forums on Digital Technology, Digital Education, Digital Community, Digital Memory and Digital Jobs in Champaign-Urbana, Illinois. All voices and perspectives need to be heard in the mobilization of our community around new technologies. Sign the Community Technology manifesto to get invovled. The last forum in Spring 2011 was held on Saturday, May 7, 9:30 a.m., at Salem Baptist Church, 500 East Park Street Champaign IL. View the videos and flyer from this event for more information. Eighty people attended the eBlack Champaign-Urbana Community Technology in Champaign-Urbana Forum held the morning of Saturday, March 19, 2011 at Champaign Public Library. Watch the full proceedings of this event at. A Careers, Jobs and Technology Conference was held Saturday, January 8, 2011, 9 a.m. to noon. at Champaign Public Library. Watch the full proceedings of this event. A Two-Day Campus-Community Symposium was held November 5-6, 2010 in Champaign-Urbana, one day on campus and one day in the community. Below are links to the records of this important event.